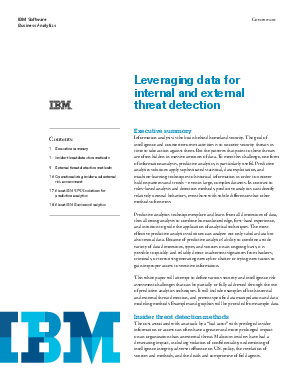 In this technical white paper from IBM, learn how predictive analytics can be used to detect internal and external threats to your organization. You will learn how techniques including cluster analysis, anomly detection, time series analysis, social network analysis, predictive models and scoring can be used to detect suspicious activity in real-time so your orgnization can take action to minimize risk and increase positive outcomes. As a final step, you will learn how automating model creation and scoring to ensure recent data points and observations are included in your analysis will further lessen the likelihood and impact of security event.